So… I went to Seattle! Ok, it was a few weeks ago, but I’ve been real bad about updating posts lately. 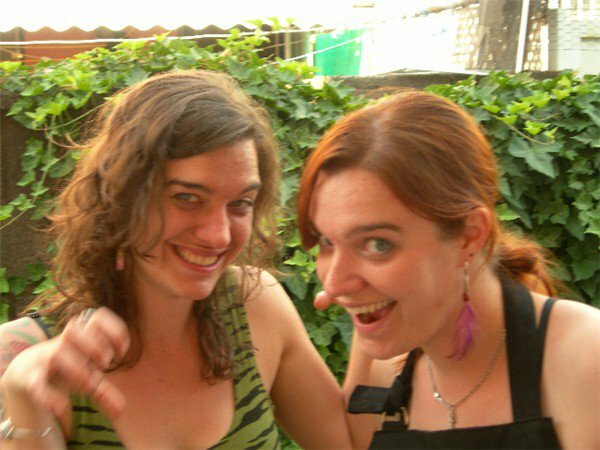 Alexis and Lou have been trying to get me to visit Seattle for years. Even before Alexis moved out there, Lou had a campaign to get me to visit. At first on a student budget, a trip seemed out of reach. Then work and life got in the way, and I just kept putting it off. Now I’m a freelancer, and taking time off is always tough. But I’ve been doing well, and I figured I could sneak in an extended weekend out to Seattle. Combined with the super cheap tickets Alexis found, my trip was booked before I really thought about it. Of course, a client wanted to book me the week I was gone, and I got other calls about work that I couldn’t take- but if you worry about that as a freelancer, you’ll never go anywhere. 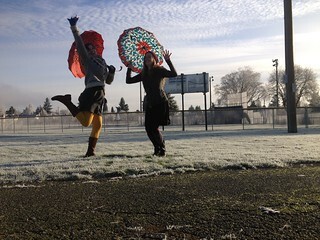 On our way home we stopped by an icy field for a photo shoot with some umbrellas that Alexis rented from Bella Umbrella. Sure, we got some funny looks when we told people that we were renting umbrellas. But you know know? It was worth it. 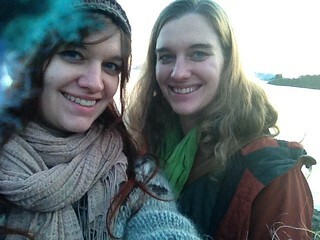 We had so much fun out in that field, with Alexis’ phone balanced precariously on an icy bench, playing with a self-timer. Even though the trip was a vacation for me, Alexis still had to work. She’d work from home during the mornings (and from her phone while we were walking around) and then we would head to her office in the afternoon. Her office is right downtown, an easy walking distance from Pike Market, so my exploring of the city was around there. One day we took a trip around the Great Wheel, the huge Ferris wheel at the end of the pier. One of Alexis’ friends is only familiar with me based around the dinosaur Halloween costume I made a few years ago. I guess Alexis was hanging out with him when I sent her a picture of it, and it left quite an impression. 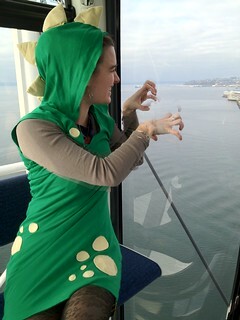 I brought the dress by request, and Alexis quickly slipped it on over her clothes when we were traveling on the wheel. What can I say, we’re all about the photo ops! One thing that I was pleasantly surprised to discover were all the tea shops in Seattle. Chris and I have a tea blog that we collaborate on (well, he posts the most, but I try to contribute, too!) and I’ve been learning a lot about loose leaf tea lately. That combined with the fact that the day I was due to land back in Philly was Chris’ birthday meant I went into tons of shops looking for good presents. I found some great stuff, and can’t wait to bring him back to Seattle to visit all the great tea places with me. I don’t remember the first time we walked by Piroshiky, Piroshiky but I became obsessed. 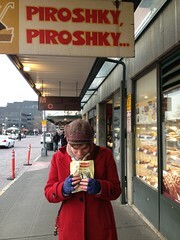 The shop smelled awesome, and while I’d never heard of Piroshikys before, I knew I wanted one and it would be amazing. They’re basically pastries stuffed with various things. I was in a haze when we got there (so excited!) that I didn’t really take in all the options, and got a simple potato and cheese. I don’t regret the choice, but after looking up the company once I was East Coasted again, I realized I missed out on trying some interesting varieties. Next time, Piroshiky, Piroshiky. Next time. Other highlights of the trip? We got twin tattoos on our left wrists. While it didn’t go exactly as I had hoped (I had a bit of a freakout when we unwrapped the tattoos, since they were distinctly different looking, and they weren’t really supposed to be) I’m really glad we got them. We went rock climbing with Alexis’ friends, which was fun. My circus classes had me well prepared for scaling the climbing wall, but man, those climbing shoes are not comfortable. I prefer the barefoot climbing we do at the circus school. We met up with Lou and Dave (our Aunt and Uncle) for a great dinner and game night one night and then happy hour and a National Geographic lecture another night, which was great. Overall it was the perfect amount of time, and a really fun trip. Meeting a whole bunch of Alexis’ friends was really great, and I’m glad I finally got to see the Emerald City. Thanks, Seattle, for being such a great vacation! You’d think being un (or under)employed I’d have plenty of time to keep posts up to date. I don’t know quite where my time goes every day. Looking/applying for jobs. Keeping up with paperwork. Trying to meet up with friends and network connections for lunch, working on Karin’s documentary… soon I find the day is nearly done. So here are some photos from the past few weeks. A weekend trip to Boston for the Red Bull Cliff diving, some canning with Karen, a ride on a tug boat… the weekends appear to be just as full as my week days. We smoked the rest of them! Last year we went to Detroit, this year… Nashville! We went by way of Nashville to visit Amy (and see her awesome house in person! It looks great!) and then through Pigeon Forge and Chattanooga. Pigeon Forge was my call… I just love Dolly Parton, and somewhere along the line in planning for the trip got it in my head that we should go to Dollywood. Eventually I realized that an amusement park in the winter wasn’t really going to be too great. Plus I really just wanted an awesome Dolly museum or something. So instead… Dolly Parton’s Dixie Stampede dinner show! It was fantastic. And cheesy. And absurd. Basically everything I had hoped it would be. Complete with a black-light dancing toy segment, a lumberjack competition and horse tricks. Dolly Parton's Dixie Stampede Dinner & Show! Pigeon Forge itself was absurd. Paired with Gatlinburg, its apparently quite the destination in the Smokey Mountains. Hello tourist trap! Lots of go-kart tracks, dinner shows and bizarre museum-ish things. More “Old Timey Photo” shops than I’ve ever seen. (I was dying to stop at one, but we decided we’d do it in Nashville… but alas! No photo shops there! Oh well, next time.) I could see why Amy politely turned down our invite to join us at the Dixie Stampede… but I had a ton of fun. Next stop- Chattanooga. It was a nice little town. And apparently the home of Moon Pies! We stopped in the Moon Pie general store, and stocked up. Best little shop ever! The mint moon pies are like thin mints, but better. Chattanooga has a cute little arts area with a nice sculpture garden, and a pretty decent art museum. One of the big draws in town is Lookout Mountain, home of the Ruby Falls cave and Rock City. (Man, are these folks good at monetizing their natural environment!) Ruby Falls is an underwater waterfall in a cave with a pretty impressive tourist structure. Well made paths, lights and an elevator that brings the folks down. We got an awesome almost private tour, since its the off season and there weren’t that many folks going through. After our stop at Ruby Falls, we headed over to the Christmas spectacular at Rock City. The whole place was lit up quite magically. We got there right when it opened, which was great because we didn’t end up stuck in a huge group as we walked along the path. I thought it would be kinda cheesy… don’t get me wrong, there was a pretty high level of cheese… but it was actually really nice and I’m glad we went at night to see it all lit up. On our way out of Chattanooga we decided to stop by the Jack Daniel’s distillery. It was about an hour out of our way, but it was a free tour, and we didn’t have anything particular set for our next stop, so seemed like a good detour. Again, a pretty awesome almost private tour. Traveling in the off season can be pretty awesome! It was an interesting tour. Oddly enough, they’re in a dry county, so can’t actually sell the product. (Though they do have ‘collectors bottles’ that happened to be filled with whiskey.) Some folks on the tour with us were buying a whole barrel through the “Single Barrel” program that they have at the distillery. I’m assuming they own a bar or something. What else would you do with a whole barrel of whiskey?? Next- Nashville! We stayed right in town, and walked around quite a lot. Swung by the honky-tonks, checked out the Country Music Hall of Fame, and the Ryman Theatre (original location of the Grand Ol’ Opry). Had the best BBQ in the world at Jack’s. Bought some boots, saw some hockey. The crowd was about half Wings fans… unfortunately they lost, but it was still a pretty good game. We drove all the way back from Nashville in one day… man was that a car ride. But it was good to be back home. Vacation is great, but sleeping in my own bed is pretty fantastic, too. The original plan was to piggyback a Cancun vacation with a conference Chris had to go to for work. But the drug war spread out, some tourists died and his company decided maybe it wasn’t such a great idea to have a “diversity forum” there. So we had the time off, and no where to go…. ROAD TRIP! Chris has wanted to see a Red Wings game at the Joe Louis arena, so we figured, why not head out to Detroit. A stop in Cleveland on the way, a few days in Detroit, stop in Columbus on the way back- not a bad trip. First of all, there really isn’t much in the big expanse of PA between Philly and Ohio. At least on the way to Cleveland we passed some greasy spoon truckstops, but from Columbus… nothing but Cracker Barrels. That part aside, it was a really great trip. I took tons of photos, the album is over on flickr. Here are a few of the highlights. The Great Lakes Science Center in Cleveland. Really really fun! It was right next to the Rock and Roll Hall of Fame, which neither of us really had any drive to go to. Plus, it was rather pricey. The Science museum was only $8 and had the added bonus of a special NASA exhibit, instead of the Springsteen exhibit at the Hall of Fame. We got there an hour before closing, and had the place nearly to ourselves. Great interactive exhibits, really interesting and would be fantastically educational for kids. I got on the jumbotron with my sign! We spent a few days in Detroit. We stayed right downtown, and wandered around there for a little bit. The city felt a bit desolate, lots of boarded up shops. Turns out a lot of the shops are in inside malls, all connected by walkways- so its a bit tough to find places unless you know what you’re looking for. We went to a Red Wings game the first night, had a blast. The next day we went to the Ford Rouge Factory tour- but couldn’t take any pictures of the assembly plant. Then we drove out to Grosse Pointe in search of yarn store with local fibers. The store had moved without updating their google listing, so we went on a bit of a drive up the coast. It was super foggy, and absolutely beautiful. The Edsel and Elanor Ford House. A random place we drove by on our way to the yarn store (my souvenirs for the trip!) and stopped by to kill time before the Cadieux Cafe opened. We didn’t go in the house, but did the walking tour, despite the fog. I think I actually liked it better because of the fog- felt like a fairy tale. It was definitely a posh place, I could see the wealthy Grosse Pointe mansion dwelling ladies having tea there and discussing charity auctions. Belgian Feather Bowling. I have a whole bunch written up over on flickr about this… so fun! The Cadieux Cafe is apparently the only place in the country where you can play this. The freelance editor at work told me about feather bowling, and a few days later Chris and I saw a hockey game where the away announcers had a little segment about what they did while in Detroit, and included feather bowling. Sold us. We got a lot of great dinner and bar recommendations from the bartender, too, as an added bonus. We swung by Columbus on our way home. They have an artsy area called the Short North that may have been interesting if it wasn’t a Sunday. Their science museum was much more about entertaining kids than educating them, it was sort of frustrating. The coolest thing there was the spinning sparkly statue outside.